It’s finally morning on the legendary Nurburgring track, and Kazunori Yamauchi (creator of the Gran Turismo series) is currently racing as part of Team Schulze Motorsport on the #71 Nissan GTR. We left Yamauchi and his companions a few hours ago in 28th position overall and 2nd in class SP 8T, but now the situation has improved. #235 WV Golf GT of the Wolkswagen Motorsport official team has been stuck in the pits for a while due to suspension problems and fell back into the ranking, allowing the #71 GTR to overtake them, taking class lead for the moment. But the race is still long, with eight hours and a half to go, and #35 is back in the race, counting on the experience of veteran ex-F1 drivers like Jhonny Herbert and Mark Blundell, it’s lapping very fast, so the battle for first position in the SP 8T class will be fierce. As yesterday I will cover the race live, and edit this post periodically to add information and updated news on the race and on Yamauchi’s team. So reload the post often! But get down to business and start our coverage, that will continue to the end of the race at 4 PM local time. You can find our coverage for yesterday and the beginning of the night here. 7:39 AM: #71 GTR is going at a very constant pace, around 9 minutes, 30 seconds per lap, as has been for the whole race. It’s currently in 27th position overall and leads the SP 8T class at the end of 90th lap. #235 Golf GT is in 37th position, three laps behind, but lapping very fast. They just clocked a 9:04:484. The battle is still on, and it might become fierce in the hours to come. In the meanwhile Team Need For Speed #77 BMWs was involved in a spectacular incident, hitting another car and then jumping over the armco, flipping over out of the track. Let’s hope the driver is ok! 7:43 AM: The driver of #77 has been confirmed safe. Yamauchi’s #71 is still stably in 27th position overall at the end of the 91st lap. 8:00 AM: News come directly from Yamauchi on his Twitter account (looks like he’s not driving at the moment): “Still racing at the Nurburgring 24h. 27th overall and 1st in class. We’d like to contonue like this to the end”. The overall leaderboard is led, at the moment, by #18 Porsche. Below you can see Yamauchi’s GTR tailing the current leader closely as they avoid the area of a crash. 8:23 AM: Yamauchi’s #71 climbed to 26th position, but lowered the pace a little bit. It just clocked a 9:48.962 95th lap, as the TV camera focuses on it. It’s relatively cold and very damp on the Nurburgring with 15°C and 91% humidity. Just under eight hours to go. 8:45 AM: #71 is still stable in 26th, but #235 now in 36th is gunning it, clocking 20 seconds faster laps. There are still three laps between them, but the battle for first place in SP 8T is definitely not decided yet. 9:00 AM: Yamauchi’s GTR just lost a position during lap 97, keeping a stable pace just under 10 minutes a lap and is now 27th overall. Still leading the SP 8T class. 9:18 AM: #71 is losing positions, now 31st overall. They had an extremely slow lap, clocking 23:55.530. It may have been a longer pit stop to solve whatever problem was causing them to slower the pace compared to yesterday and last night. We’ll see at the end of next lap if things go back to normal. TV coverage will be paused for the next couple hours, so we’ll have to be happy with static cameras until 11 AM. 9:32 AM: #71 is back on it’s usual pace, and back on 30th position overall. The gap with #235 has closed considerably now. The Golf GT is just one lap behind. 9:54 AM: Yamauchi’s #71 Might be having problem. They clocked lap 101 at 25:46.234. 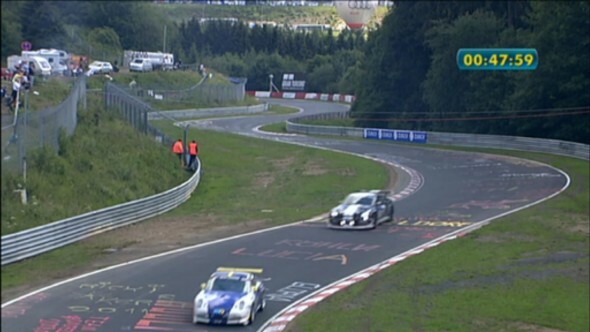 The #235 Golf GT managed to overtake them, but positions might switch again as the Golf just went into the pits. Let’s hope Team Schulze manages to clear the problem! 10:05 AM: Team Schulze seems to have cleared the problem. #71 clocked a 9:23.170, now battling closely with #235, that’s still ahead. 10:26 AM: the #71 GTR has finished lap 104 in 9:21.193. #235 is speeding ahead though, thanks to the lighter weight and the elite drivers at the wheel. They just lapped on 9:09.417 and overtaken #134 Audi TT S, so now there’s a car in between the two contenders for the SP 8T win. 10:46 AM: The gap is increasing between #71 and #235. The GTR finished lap 106 in 13:16.444, while the Golf GT did an awesome 9 minutes flat lap. 11:23 AM: #71 is now past the 110th lap, still in 34th position overall and 2nd for the SP 8T class. There are two cars between it and #235, which is lapping costantly faster. The GTR is going steady, though, the technical problems from before seem to have disappeared. 11:40 AM: team Schulze’s #71 just gained a position, in 33rd overall now. 12:00 PM: More technical problems for #235 Golf GT, currently stuck in the pit lane. We don’t know it’s current status other than that. Yamauchi’s #71 is back in the lead in class SP 8T. This is the nature of endurance racing. The GTR is heavier, but so far it’s also proving sturdier, while the VW’s are proving not as reliable. 12:30 PM: #71 is currently in 31st overall position, lapping at a lovely constant 9:30-ish pace. It’s looking good to get back in the top 30 soon. 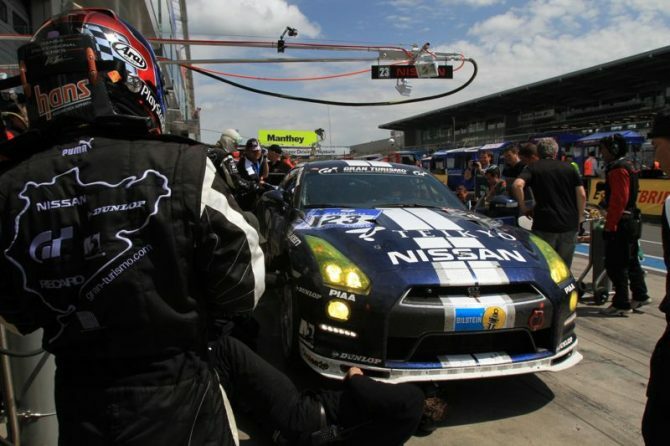 12:54 PM: the #71 Nissan GTR just had a quick pit stop and came out still in 31st position. 1:20 PM: Yamauchi’s #71 seems to be having some kind of trouble again. Fell back into 35th position, after a 25:48.515 lap. We’ll have to see what happens during the next lap or two. 1:27 PM: #71 just clocked a 9:46.564 lap, so whatever problem it had before, it didn’t stick around. 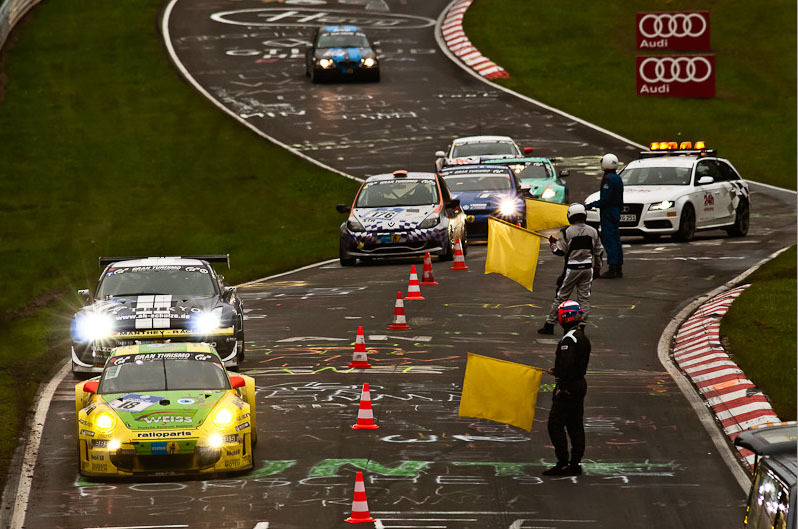 Though now the #73 Götz Motorsport Audi RS4 closed the gap, just two laps behind, racing more or less on the same pace. Who will win the SP 8T class? 1: 50 PM: #71 has now regained 34th position, opening the gap with #73 a little more. 2:19 PM: #71 currently in the pits, it’s still two laps ahead of #73. Yamauchi’s team is going to make us sweat to the very last moment. Hopefully everything will be ok in the final hour and fourty minutes. 2:34 PM: #71 is still in the pits, dangerously losing time. They’re probably having more technical problems. #73 seems to be having trouble as well, though, in the middle of the course. We’ll have to see how this duel ends, or more, who manages to solve their problems first, if at all. It’s a critical moment for Yamauchi’s team! 2:43 PM: Yamauchi’s #71 GTR just came out of the pits after an excruciatingly long pit stop, due to unspecified technical problems. It’s still in the lead of SP 8T class! As a side note, #88 Gazoo Racing Lexus LFA had a serious electrical problem and had to stop on the side of the track. Too bad, because they are great guys and the car looked fantastic. 3:00 PM: Team Schulze’s #71 is in 38th position overall now, due to the twenty-some minutes spent in the pits. #73 is stationary on the side of the track. It’s probably game over for them. Yamauchi’s team has been plagued by mechanical trouble this morning, but they’re still firmly in the lead. One hour to go! 3:09 pm: #71 is gunning it again, with a quite fast 9:21.495 128th lap. Still in 38th position overall. 3:45 PM: #71 continues to clock constant laps around 9:30. Still in 38th position overall and leading the SP 8T class. The critical moment seems in the past now. Bring it home! 3:52 PM: The judges just signaled the last lap! 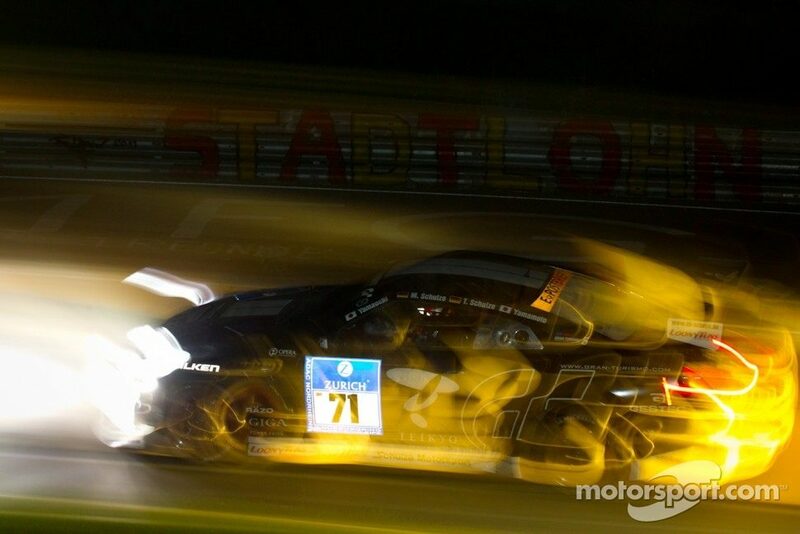 The #71 GTR has managed to gain a position is now 37th overall. Still leading the class. It’s almost done. Good job team! 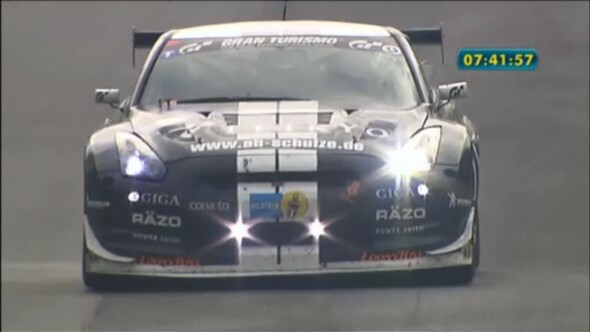 Kazunori Yamauchi and team Schulze are bringing home an epic victory in the SP 8T class at the Nurburgring 24h! 4:00 PM: The end! 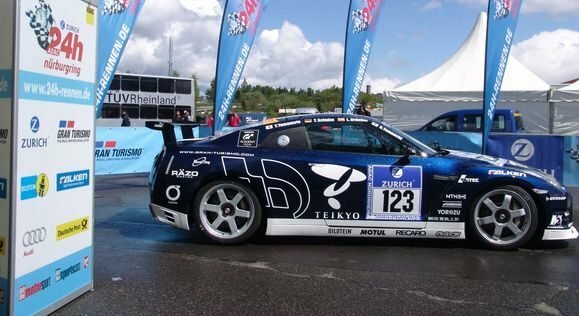 Yamauchi’s GTR finishes 37th overall, and achieves a fantastic class victory!